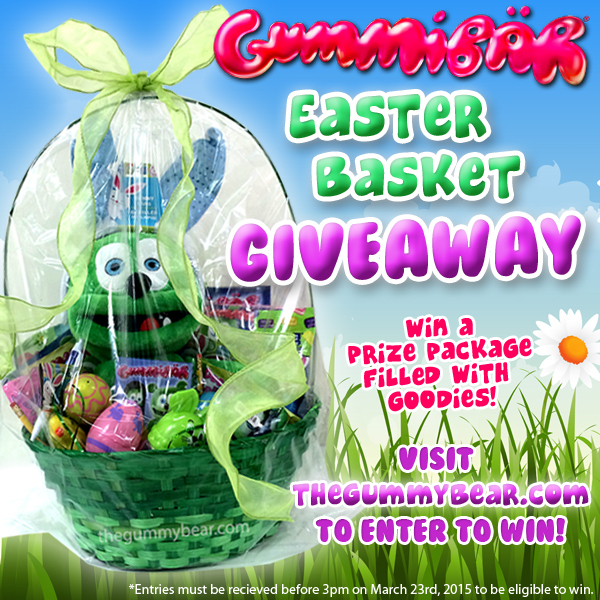 Fourth Annual Gummibär Easter Basket Giveaway Announced - Gummybear International Inc. The 4th annual Gummibär Easter Basket Giveaway has been announced. One lucky Gummibär fan will win a festive Gummibär-themed Easter Basket filled with Gummibär merchandise and Easter goodies including a 12″ plush toy, a USB flash drive, two pens, two pencils, a notebook, an I Am A Gummy Bear CD, a La La Love to Dance CD, surprise Gummibär eggs, and assorted Easter candy and goodies. The retail value of everything inside the basket is over $100. First, they must be sure to sign up for the official Gummibär Email Newsletter, if they have not done so already. A subscription form for the newsletter can be found on the home page at http://www.thegummybear.com. Second, fans must leave a comment saying what song they would like Gummibär to sing next on the Easter Basket Contest post at and be sure to use the same email they used when they signed up for the newsletter. All Gummibär fans that fulfill the contest requirements by 3 pm EST on March 23rd will be eligible to win. One lucky random winner will be notified by email within 24 hours. The first Gummibär videos were posted on the internet in 2006 and since then the character has gone on to become one of the most successful animated characters on the internet ever with more than 4 billion combined video views on YouTube alone. The character’s music has been released in over 40 different countries and in over 27 different languages. He has his own animated Christmas special as well as a growing line of character merchandise. Gummybear International is engaged in the creation, development, and branding of animated entertainment properties, as well as musical content based on and produced for such properties. It markets and sells recorded musical and video products in various physical formats, such as compact discs and DVDs, and digital formats, such as downloads and ringtones, through a worldwide network of established distributors and licensees. The company’s music publishing segment owns and acquires rights to musical compositions, markets these compositions, and receives royalties or fees for their use. It also is actively developing mobile and computer based games and exploiting merchandising rights for its brands in cooperation with a variety of licensing partners. GBI is working on a number of film and TV projects.